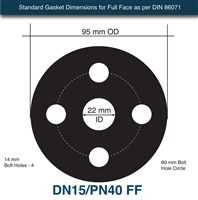 Equalseal.com is proud to present the next generation in gasket material: Doniflex® GLD by Donit Tesnit. Doniflex® GLD has very good temperature and chemical resistance, and the sealability of GLD actually gets better with elevated temperatures. Formulated to comply with the latest environmental and safety standards, GLD is made in a water based manufacturing process, and is completely nitrosamine free, making the handling and fabrication of this material hazard free. Doniflex® GLD meets the latest European Union health standards for worker safety.